Western Digital announced they will produce a hard drive capable of holding over 40TB of data. At a recent event, Western Digital announced a recent breakthrough in microwave-assisted magnetic recording (MAMR) technology. Through this incredible technology, WD projects that they will be able to build individual hard drives capable of holding over 40TB of data by 2025. Imagine the capacity of a small server farm contained in a single pocket sized HDD. This would open so many doors for both businesses and individuals alike to maintain and store an enormous amount of data onto a drive that would be portable and adaptable to use with virtually any computer. Just as many falsely prophesized the death of optical media with the adoption of flash USB and SD, the demise of the standard magnetic HDD due to the propagation of the flash oriented SSD is similarly mistaken. The reason being is the same for both optical discs and HDDâ€™s, in short, the cost per GB of storage. 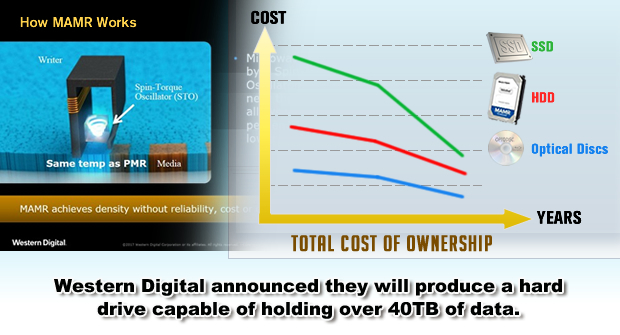 The Total Cost of Ownership (TCO) for both optical discs and HDDâ€™s in much lower and will continue to remain considerably lower than that of flash oriented products. The reason is the cost of production and the volume of production. Both optical discs and magnetic HDDâ€™s can be made cheaper, faster, and in greater quantities than their flash counterparts. So we will not see the demise of either anytime soon. In saying this, it doesnâ€™t mean the traditional optical disc and HDD will kill the flash market. Flash is still a growing and evolving storage medium in its own right and continues to gain in popularity. So flash is still the future of storage, but it will not fully replace or dominate the market as once foreseen. With the importance in both the professional and consumer market for high capacity storage, I foresee multiple forms of digital storage devices servicing an expanding and evolving marketplace that will have plenty of content to store across all forms of digital ecosystems. Vinpowerâ€™s line of Pro Duplicator Optical Disc Drives (ODD) are readily available Globally! Now that fewer personal computers come standard with optical disc drives (ODD), there are fewer and fewer manufacturers producing them. The ODD manufacturers that remain are putting less resources into maintaining the drives and are actively trying to cost down on the components used to build those drives. These factors inevitably lead to lower quality drives with a shorter life span. 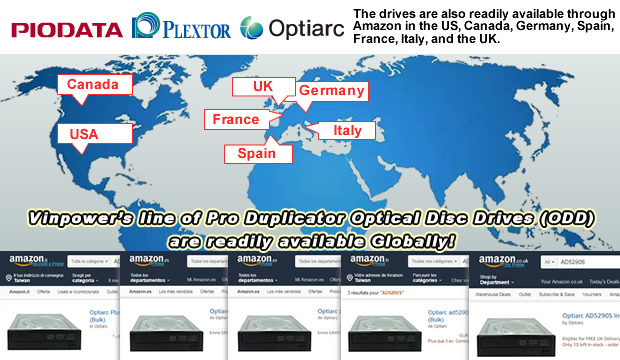 Thatâ€™s why Vinpower has worked diligently over the years to provide our own lines of professional series Half Height Optical Disc Drives, featuring the Plextor, Optiarc, and Piodata series. Each of these drives were developed to have greater compatibility, reliability, and longevity, compared to the standard off the shelf ODD’s currently on the market. These drives are perfect for building your own duplicators, replacing drives on older systems, such as manual towers, autoloaders, and publishing systems, regardless of the manufacturer, and for use with computers and high scale servers. Donâ€™t settle for subpar drives that may look cheaper, but end up costing you far more money in the long run due to shorter lifespan and inconsistencies in the burn quality, which create numerous bad burns. Instead, you can easily and quickly order any one of Vinpowerâ€™s professional line of ODD to ensure the job will get done right the first time without downtime for a defective or overheated drive. 2) Accuracy â€“ Is the drive truly what it states that it is? Is the size of the memory or the read and write transfer speed accurate? 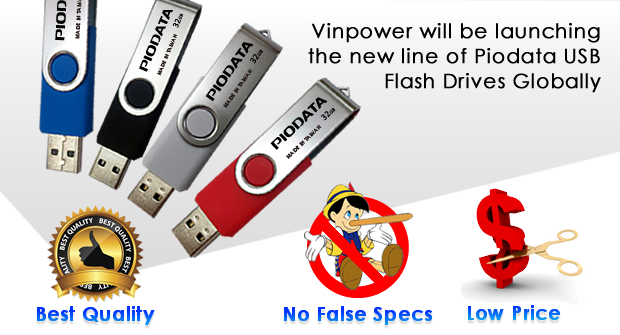 When it comes to quality, Vinpower personally tests every flash drive through our own proprietary flash verification hardware. These systems will ensure the quality and reliability of each flash drive, which gives the customer confidence that if they purchase 100, 1000, 10,000, â€¦ flash drives, they will work and the content will not be compromised. Vinpower would never offer a flash drive which is marked as a certain size, but in reality can only hold a much smaller volume of content. When Vinpower validates a flash drive as being a certain size, you can rest assured that the drive meets the specifications to qualify. Accuracy ensures reliability, which provides stability, which ensures that each flash drive will meet the high standard Vinpower has set for this project. 2) Even when you are able to find a less expensive version, in order to increase their profit margins, many of these low quality low cost suppliers will purchase flash drives that have a consistent error rate, and that will be there profit margin by mixing defective elements with more reliable parts and/or products. So if you constantly run into trash flash drives, those costs in terms of both time and money will become a liability and ultimately cost you more than if you just bought a quality guaranteed flash drive. 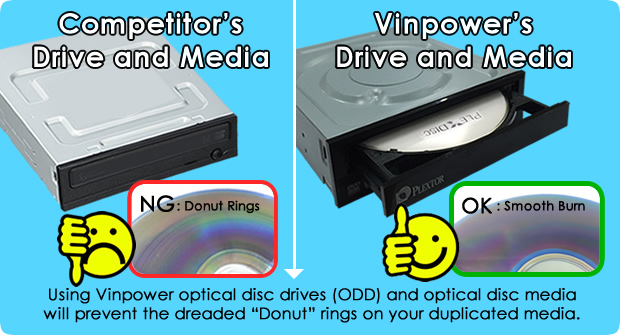 Using Vinpower optical disc drives (ODD) and optical disc media will prevent the dreaded â€œDonutâ€ rings on your duplicated media. You may have a different term for it, but when you copy a disc and you see intermittent light and dark rings on the burning side of the discs, (â€œDonut Ringsâ€), that is a clear indication that you are having compatibility issues between your drive and your media. High quality duplication should leave the recordable side of a disc smooth and seamless for the most part. So when you can clearly see light and dark rings, what we refer to as Donut Rings, then that means the driveâ€™s laser would burn harder/more intense and lighter/less intense due to constant stopping and starting, due to problems between the writers and the media. You could lower the burn speed to try and compensate for these issues, but that may not fully resolve the Donut Rings and will greatly increase your duplication time. The Donut Ring is often attributable to the low compatibility between the media and the burner. Since the media and drive manufacturers do not work together to fine tune each item to prevent these issues, thereâ€™s not much you can do when you encounter these problems. Thatâ€™s where Vinpower Digital can help. As the only duplication hardware supplier that provides our own proprietary Optical Disc Drives (ODD) and Optical Disc media (CD, DVD, & Blu-ray), we fine tune both the media and our drives to have the best compatibility to prevent the dreaded Donut Rings and provide the best quality burns. So if you want to prevent Donut Rings and not waste time burning at a snails pace, you should use Vinpowerâ€™s drives and media together to ensure the best duplication results!